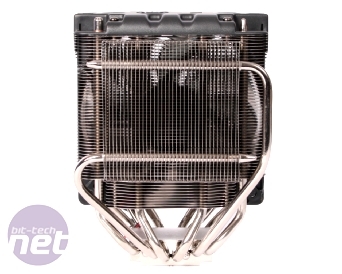 While Cooler Master might have produced some of the best cases on the market recently, its range of CPU coolers have been somewhat underwhelming and haven’t really been able to challenge the big guns of cooling on too many fronts, although the Z600 was notable as a passive cooler for chips with lower TDP requirements (albeit with a mounting system that bordered on the cruel and unusual). 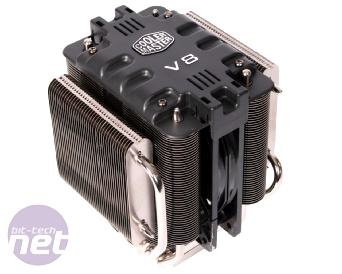 The V8 is set to change that though as a genuine high performance offering that packs a monstrous eight separate heat-pipes to help keep your CPU cool. In fact, the whole cooler is very large and is composed of four separate stacks of aluminium cooling fins, with two larger stacks in the middle and two smaller stacks of fins mounted on the sides at 90° to the centre. In the centre of the four stacks of fins is a single red LED lit 120mm cooling fan fitted into the plastic fan mount that’s been mounted atop the cooler, giving it the appearance of an engine block (V8 geddit?). It’s certainly something of a unique design, utilising both the push and pull airflow of the 120mm to maximum effect and looking as butch as a red neck drag race weekend, although the engine block fan mount is removable so to allow the fitting of alternative fans if you so wish. Nevertheless, beefy is most defiantly the word to describe the V8 – it’s big, chunky, and looks like it means business. 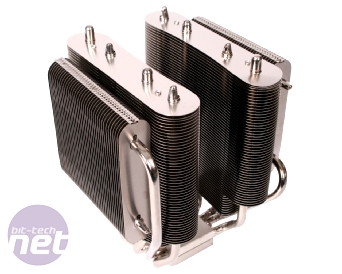 The V8’s heat-pipe array is a mix of bi-direction and uni-directional heat-pipes, with the two central stacks sharing four bi-directional heat pipes running through the centre and outside of the V8’s nickel coated copped base, with the external stacks on the sides of the cooler connected by longer, uni-directional heat-pipes. The effect makes for a very crowded base of the cooler, and we’re not sure how effective some the heat-pipes are going to be considering their distance from the centre of the cooler's base. One big bonus for the V8 though is the inclusion of an integrated fan-bus wired right into the included 120mm cooling fan. Complete with expansion slot bracket, it’s a simple addition that allows you to manually alter the voltage of the fan from 12V to 6V, allowing you to manually choose the cooler’s acoustic/cooling compromise. This is a feature we very really appreciate and while the V8’s fan is audible but un-intrusive at full speed, is exceptionally quiet at half speed. We’ll be testing both settings to see if the drop in noise affects cooling ability, but just having the option to manually adjust the fan speed is a big plus. 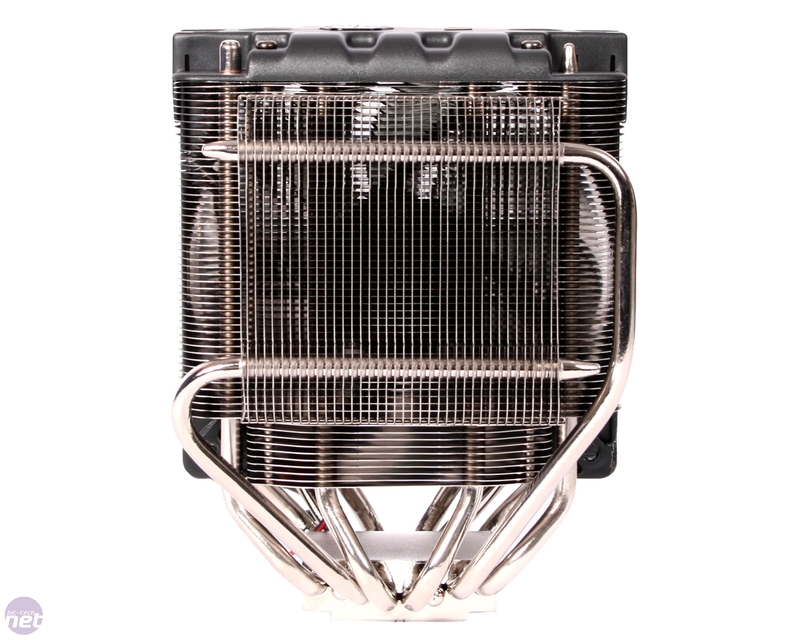 At over £55 the V8 is the most expensive cooler on test, coming in even more expensive than the dual fan Noctua NH-U12P and is a good £5 more expensive than the legendary Thermalright Ultra eXtreme 120. 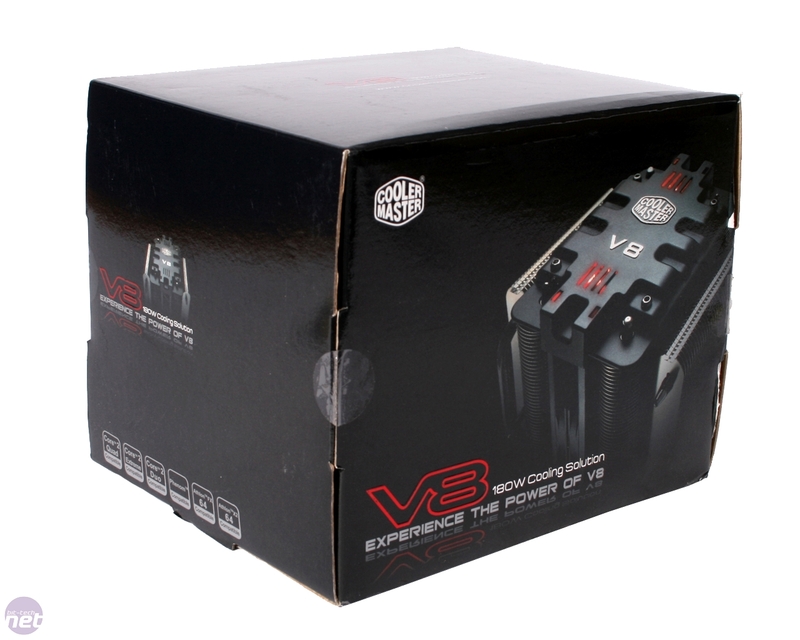 While more than £50 is hard to stomach even for a premium cooler, especially as the Akasa Nero sells for less than half the price of the V8, the extra cooling performance can make the difference if you plan on doing a lot of overclocking. Let’s hope the V8 is able to justify its premium price tag with some equally premium performance figures. So How is it to Mount? Cataclysmically bad. 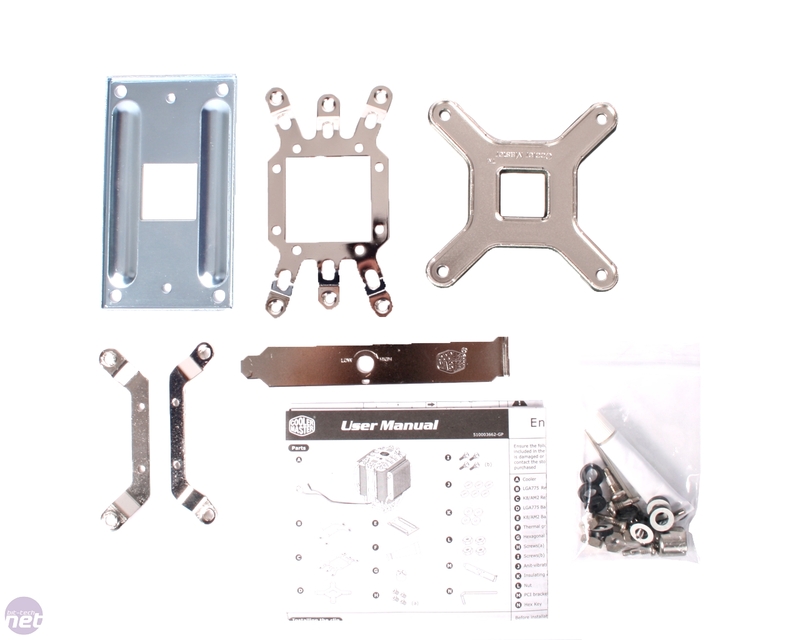 For LGA 775 the V8 uses the same maddening mounting system as the Cooler Master Z600 and the LGA 1366 mount is the same dreaded mounting system only made bigger. 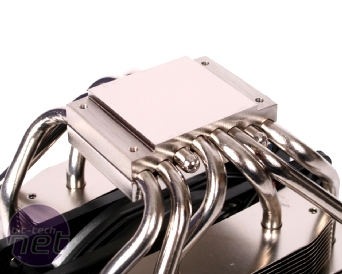 You’ll need to screw four screws from the top downwards by hand, as the cooler is too large to allow the use of a screw driver, before flipping the cooler over and dropping your fully removed motherboard into place on top of it, before finally tightening four bolts onto the end of the four screws poking through from the other side. It’s just an awful way of mounting a heatsink, especially when you discover you haven’t tightened the top down screws by hand enough and have to go fumbling blindly underneath the motherboard to tighten them up a few more turns. Having said that though, once in place the mount is extremely secure and does have some nice inclusions like rubber grommets to prevent damage to the motherboard and vibration. If only it wasn’t such a total pig to mount in the first place. 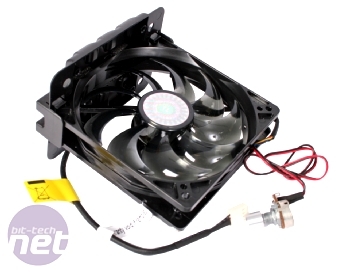 It's come to our attention that the review sample of the V8 we were given by Cooler Master was an early sample, and thus did not come with an LGA 1366 mounting bracket. 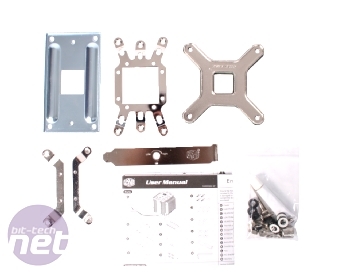 Since then, all Cooler Master V8 stock on sale now comes with all three mounting brackets for LGA 1366, LGA 775 and AM2, a fact we were not aware of when we wrote the review. As such, we have editted this page, and the final thoughts and score of the Cooler Master V8 to reflect this.